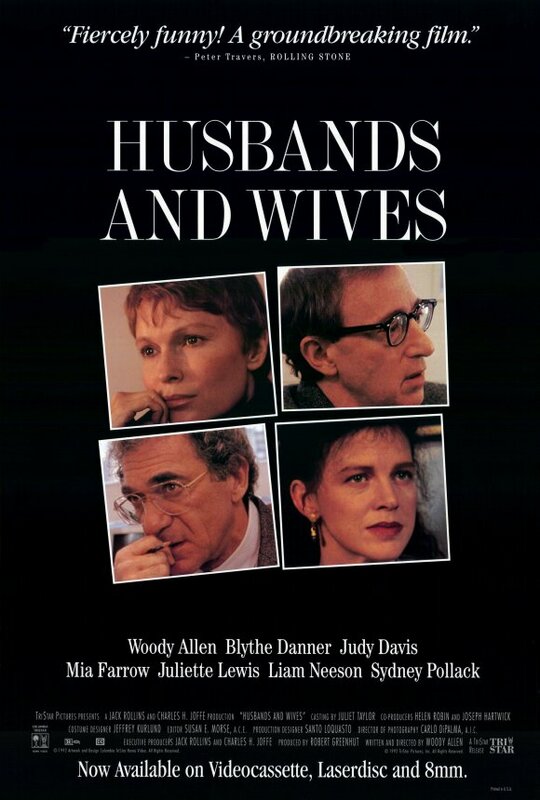 Woody Allen wrote and directed this film, which came out in 1992, around the time his relationship with Mia Farrow came to an end and his personal life became non-stop tabloid fodder. That fact that several of the themes of this film mirror the events of this real personal life didn’t help stop the public feeding frenzy. Woody and Mia co-star as married couple Gabe and Judy. They’ve been together a long time and are seemingly happy at first, but soon it because apparent that they’re in a bit of a rut. In the opening of the film they’re preparing to go out to dinner with their longtime friends, Jack and Sally, another married couple played by Sydney Pollack and Judy Davis. when Jack and Sally arrive they announce that they’re separating. They try to make it clear that they’re still on good terms and this is a mutual decision and amicable parting, but Gabe and Judy are astounded. Judy in particular seems to take this harder than expected. When then see how Jack and Sally adapt to their single life. Jack almost immediately starts dating a much younger woman named Sam (played by Lysette Anthony, which drives Sally crazy when she finds out. She initially doesn’t have as much luck dating, until Judy sets her up with one of her coworkers, Michael, played by Liam Neeson. Meanwhile, their friends separation begins to cause friction between Gabe and Judy, as they each start wondering if their own marriage is as rock as Jack and Sally’s was. They briefly argue about the possibility of having another child, but decide against it. Judy realizes that she had feelings for Michael herself, and gets a little jealous of him and Sally. Gabe, who is a college professor, begins spending a lot of time with Rain, a 20-year old student of his, played by Juliette Lewis. Rain is an aspiring writer, who takes great interest in Gabe’s writing, something Judy doesn’t do, and we learn that she also happens to have a history of dating much older men, which her parents don’t have a problem with. Jack is enraged when he finds out that Sally is dating and sleeping with someone else, he breaks up with Sam after an outrageous argument at a dinner party that he takes her to, Mia fights her own feelings for Michael, who reveals he feels the same, and Gabe fights his attraction to Rain. It’s all one great big mess for the characters, but adds fantastic drama for the audience to watch. This is a very engaging story full of compelling characters, who feel all too real. Some of the subject matter, including Gabe’s attraction to Rain, may have hit a bit too close to home for some, considering the stories of Woody’s personal life at the time, but ultimately this is one of Woody’s best films.